More Americans than ever are concerned about the environment, and you can put your environmentally conscious beliefs into practice by choosing sustainable building materials for your next home remodeling project. 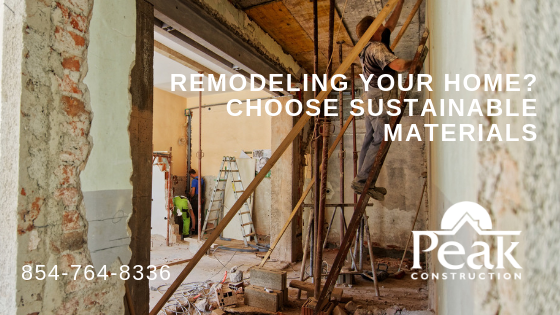 Peak Construction in Hudson Valley offers green building services to help you make environmentally responsible decisions with your home renovations. Most people mistakenly assume that green building is reserved for expensive new builds and commercial projects, but in reality, any homeowner can make green building choices for even small renovations and remodeling projects. The heart of green building as a design philosophy is to choose building materials from sustainable sources. This means wood sourced from sustainable timber operations and other raw materials produced with ecologically responsible practices. Green building offers savings in the form of energy-efficient building options and reliable structural materials that improve insulation and indoor air quality, and as added resale value if you decide to sell your home in the future. If you want to build a new porch or deck, choose sustainably sourced building materials and ask your contractor about green design choices that capitalize on available sunlight and tree coverage. Adding a new room or wing to your home can provide ample opportunities to use green building materials and improve the overall ecological impact of your home. Switching to energy-efficient appliances and power can also reduce your environmental impact and lead to lower utility costs. Whenever possible, opt for recycled building materials. Most of these materials offer the same (or better) structural reliability of less environmentally friendly varieties. These are just a few examples of green building choices you can make for your next home remodeling project. Peak Construction in Hudson Valley can help a homeowner determine the best green building options for any remodeling or renovation project.